After the 4 day MVP Open Day summit got over on Saturday, I stayed back for a day more in Hyderabad to speak at the Community Tech Days event. I got up a little late and wrapped up my breakfast soon and reached the venue. 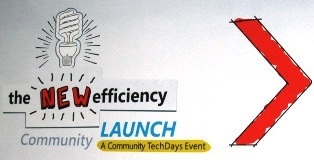 The Agenda of the Hyderabad Community Tech Days (CTD) looked something like this. 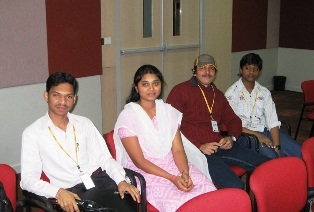 While I and Abhishek entered the venue, Hima was about to complete her session on Web Development Enhancements in VS 2010. She did it really well. Must mention, she was surrounded by many people asking her lot of questions. That gave me an idea on how good this audience were. Following her was Arun who spoke on the developer’s perspective of WCF. He covered the concepts just the way, the audience needed. Though the whole agenda got delayed a bit, the attendees were eager in hearing to him, than heading towards lunch. That gives him a big thumbs-up! 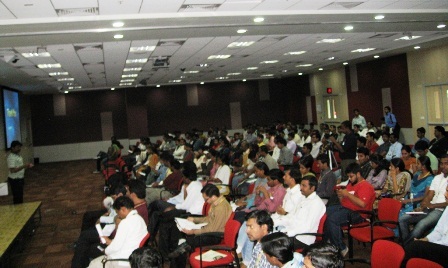 Following his session, was a 5 minute short presentation on Hyderabad User Groups! The Hyderabad Techies team (Geethika, Pranav, Shravan and Thota) just gave an overview of the activities which they have been doing, and their plans for February. It was nice young team to head the UG activities. It felt good to see the same community spirits in them, which most of the pioneers show. Post lunch, we had Hariveer Singh speaking on Visual Studio Lab Management 2010, He was showcasing the power of this one, which was a indeed a splendid product. Most of the people who were present there loved it, and was ready to recommend their employer to buy that product. That’s when it came to my mind, if the audience were IT Pros or just developers?? Because, I had prepared for a session which was more inclined towards IT Pros. When Muqeet came up to the stage, and was breaking the ice post lunch, we came to know that there were only 5 IT Pros, and the rest of them were developers! That’s when we started to modify the deck to suit the attendees. Muqeet did a good job in showcasing the features of IIS 7.5 and showed it in the demos as well. The last session of the day was mine, and guess what most of them were so tired that, I could see a few of them yawning before I could start my talk itself. Now wait, that’s never a good sign for any speaker. That’s when I thought, I would make the session more interactive and joyful. I tried something different in this talk and it worked for me. I started cussing MS on why they do come up with so many OS releases and how it is a problem for all us. I could see most of the people, responding to me. Once I got some interaction with the audience, I Gradually started moving their focus that, this release (windows 7) has something different when compared to the previous ones. I showed them some live demos and stats which were convincing enough for them that, this release indeed is something which needs to be deployed and used. I covered the Windows journey and spoke about some core OS enhancements like MinWin, Prefetch, Fast Boot, Working Set Improvements, Triggered Services, UAC and Virtualization. I also discussed on the key focus areas when you look at migrating to Windows 7. The session ended, with showing some cool demos on how to fix broken apps using Application Compatibility toolkit and Windows XP Mode. The session was well acknowledged and I did receive a lot of comments/compliments for my talk! That was one real impressive thing which happened after a tired long day! Carrying these positive memories from the Hyderabad CTD, I headed towards the Bus Station and started my trip back to Bangalore. A nice memorable day! You can download the presentation deck here!! Posted in Community Activities, Microsoft and tagged Community Activities, slide decks, Windows 7. Bookmark the permalink. Generally in last session people would n't be interested & very eager to go home. But when Vijay stared the session every one in the hall kept quite & listened to the session interestingly , in few seconds it became very interactive with lot of fun. we really enjoyed the session & learnt so many new things. As everybody is ready to go and half asleep, you waked them with lots of fun. We learned lot from your session and as well from you also. One of the things i learnt from you is to present the session according to the audience as you first made the PPT for IT Pro's and later changed it for Developers. Now I believe that i learned lot many concepts of Windows 7 after your session. Great Session. Really felt happy and a bit surprised to see a post on CTD Hyderabad in your blog. Your session was awesome, really man i liked your session, Hope such type of sessions are more. I learned one thing from you is , how to give session to the people who are already half asleep, tired. I really appriaciate you stayed for CTD and presented the session. The day and event was really fantastic and funfilled. I feel to have missed a lot!